we cannot stop to build Jeju’s second airport. 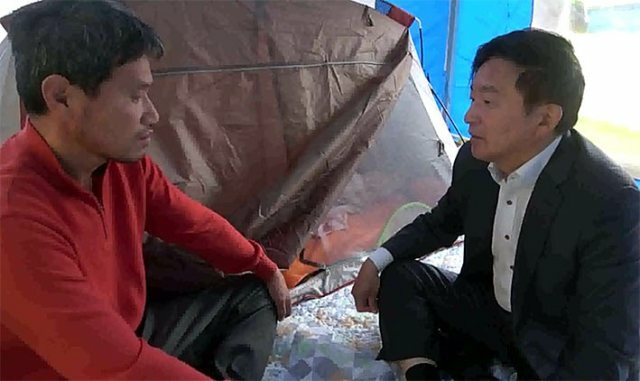 Won Hee-ryong, the governor of Jeju Special Self-Governing Province met Kim Kyung-bae, a vice chairman of the organizations protesting Jeju’s second airport and is doing hunger-strikes. There, the governor Won told him that we cannot stop to build Jeju’s second airport. Kim, the vice-chairman who met the governor, said, "Jejudo is doing the steps that violate the procedure and the legitimacy." "Are we (the opponents) not the citizens? Why are you sending those letters inappropriately without asking the opinion of the parties?" did. In response, the governor said, "Today, we have been waiting for a long time and we are in a place where we are in charge of managing our health and we are in charge of management," he said. "I do not know why we should get rid of our hometown," Kim said. He said, "When the basic plan budget is passed, we have to consult with the residents of the noise-affected area or the residents of the site," he said. "But we should send a letter to the Ministry of Land, It was hard. Won Hee-ryong said, "We do not give a veto on the matter of consultation." "We have heard a lot of opinions, so we hear enough opinions. After that, the response of the governor to the request of the vice chairman of 'Vice Chairman Kim to stop the process of the 2nd airport' and 'I can not do that' came to the end, and after that, the governor took place in about 3 minutes from the start of the conversation. It was over.